Someday All This Will Be Yours narrates the legal and emotional strategies mobilized by older people, and explores the ambivalences of family members as they struggled with expectations of love and duty. Court cases offer an extraordinary glimpse of the mundane, painful, and intimate predicaments of family life. They reveal what it meant to be old without the pensions, Social Security, and nursing homes that now do much of the work of serving the elderly. 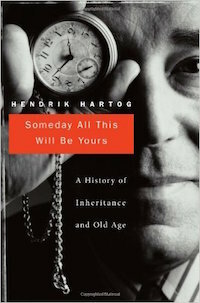 From demented grandparents to fickle fathers, from litigious sons to grateful daughters, Hartog guides us into a world of disputed promises and broken hearts, and helps us feel the terrible tangle of love and commitments and money. From one of the bedrocks of the human condition—the tension between the infirmities of the elderly and the longings of the young—emerges a pioneering work of exploration into the darker recesses of family life. Ultimately, Hartog forces us to reflect on what we owe and are owed as members of a family.